"I joined Cobra you to fight imperialism. And now look at us. Not fighting to support our allies. Just talking." Screams of "Cobra" followed by a succession of "la" usually signifies you're about to be set upon by a pretty nasty organization hellbent on shaping the world in their image. It certainly doesn't make them unique or necessarily any more or less dangerous than other groups of their ilk. It does typically require a counter-measure; a group specifically trained to deal with such an enemy like G.I. Joe. What happens when that enemy appears to become a friend? 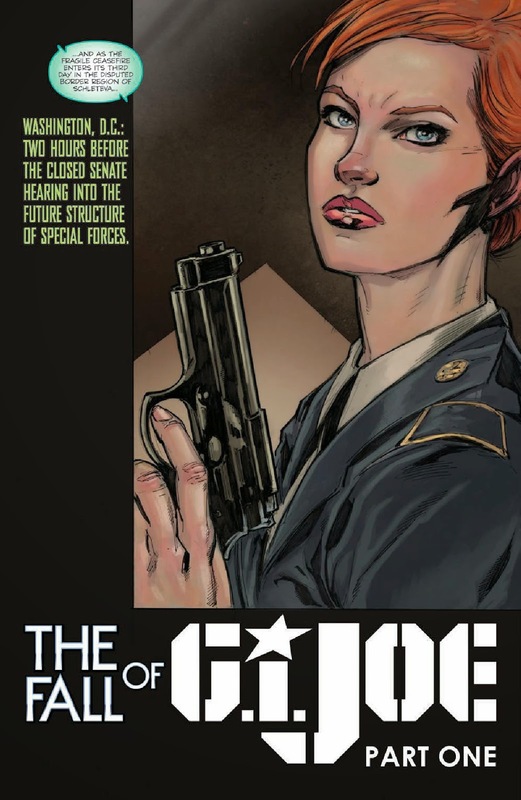 IDW Entertainment explores a new dynamic in G.I. Joe #1: The Fall of G.I. Joe. 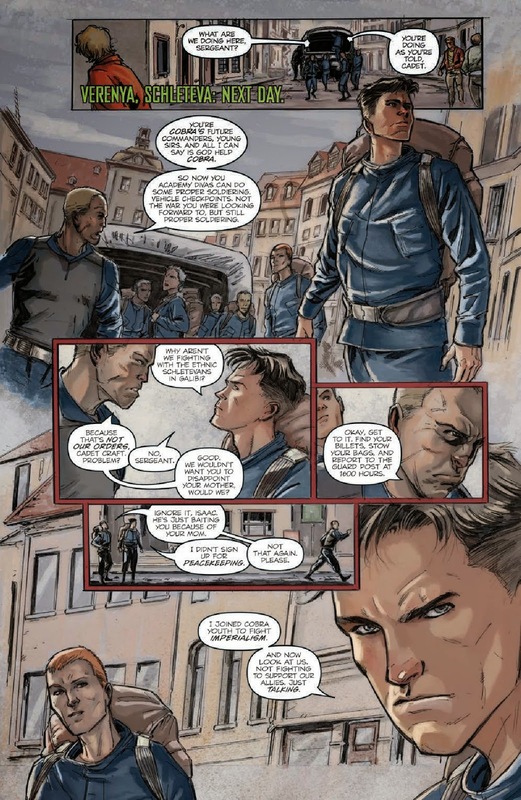 The issue is written by Karen Traviss, illustrated by Steve Kurth, colored by Kito Young and lettered by Tom B. Long. Cobra has relinquished their role as international terrorist organization and has taken up something a bit more peaceful. In fact, they're now an international peacekeeping force. This has rendered the presence of G.I. Joe as a little unnecessary. 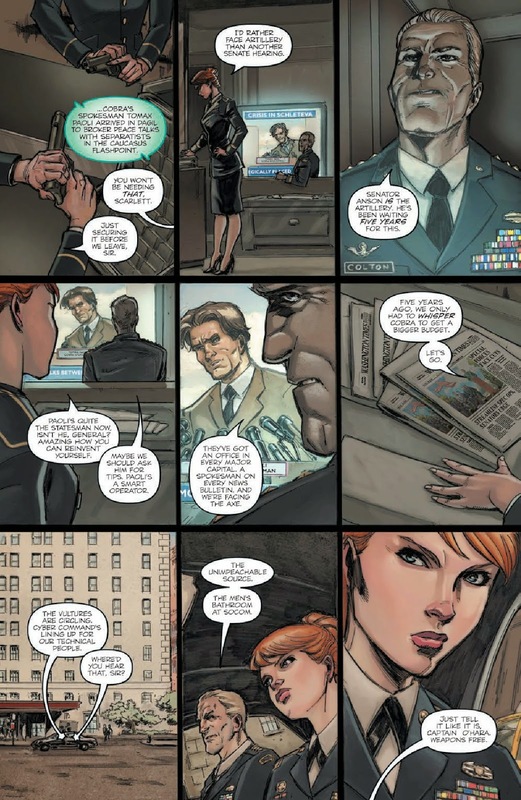 Scarlett leads what's left of America's ultimate fighting force, only now she's leading them against Senate sub-committees and a public perception that the group is no longer needed to keep the world safe. Real-world action and politics collide… and nothing will be the same. G.I. Joe in general has typically traded on the "Real American Hero" aspect of the property more so than the "Real Geopolitical Consequences of Their Actions" side of things. In G.I. Joe #1: The Fall of G.I. Joe, Traviss inverts that dynamic significantly. The Joes she presents are fighting for their lives, but not against a hail of gunfire; rather, they're fighting to stay relevant. It's a very interesting proposition that Traviss does a great job of exploring, pitting Scarlett against a government looking to cut budgets. The book draws a perfect parallel to the recent NSA revelations, in that the government was content to spend money on "security" (in this case, the G.I. Joe program) until they were deemed no longer necessary or a PR disaster. Traviss doesn't present the program in G.I. Joe #1: The Fall of G.I. Joe in any way that resembles the NSA debacle, but they do share similarities in terms of how they're approached by nervous Congress members. Illustrating hearings isn't exactly the most exciting thing in the world, but Kurth manages to do so in a way that feels at least slightly interesting. He uses angles with the characters that vary greatly, with all of them typically showing off some form of grimace or menacing stare. The book feels like it opens up as the it progresses, as the early pages are chock full of panels while the later ones not so much. 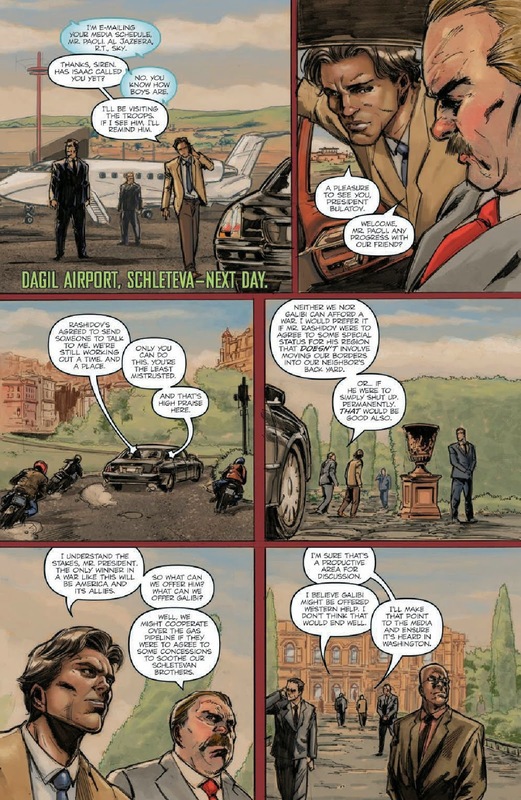 The panel layouts follow a very rigid and safe structure, with Kurth eschewing quirkier layouts in what is likely an attempt to mirror the bureaucracy of the government. 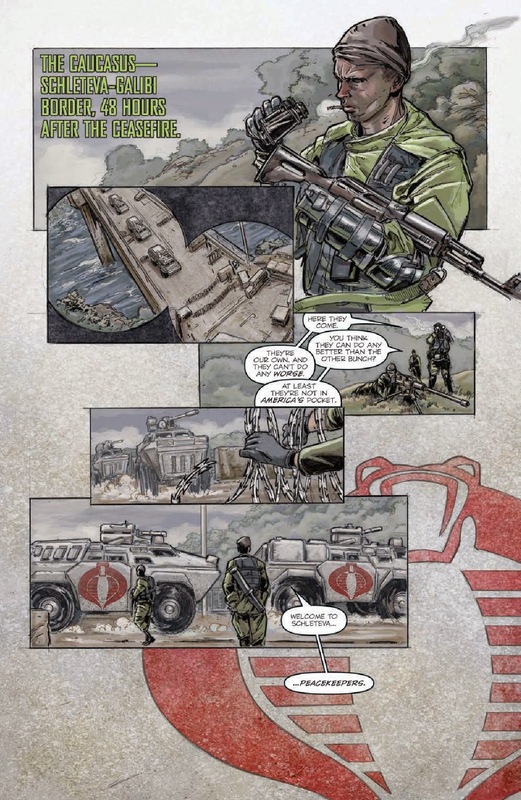 There really isn't much in the way of action in G.I. 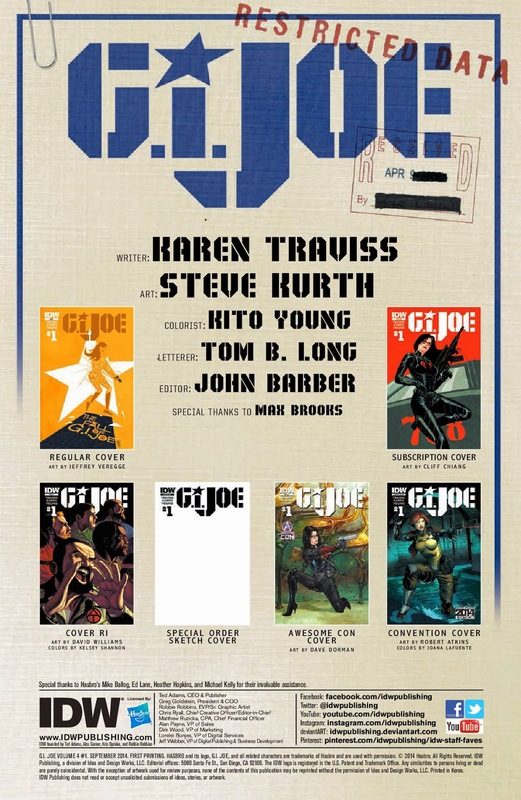 Joe #1: The Fall of G.I. Joe, but there are quite a few familiar faces who are easily identifiable by G.I. Joe fans. G.I. 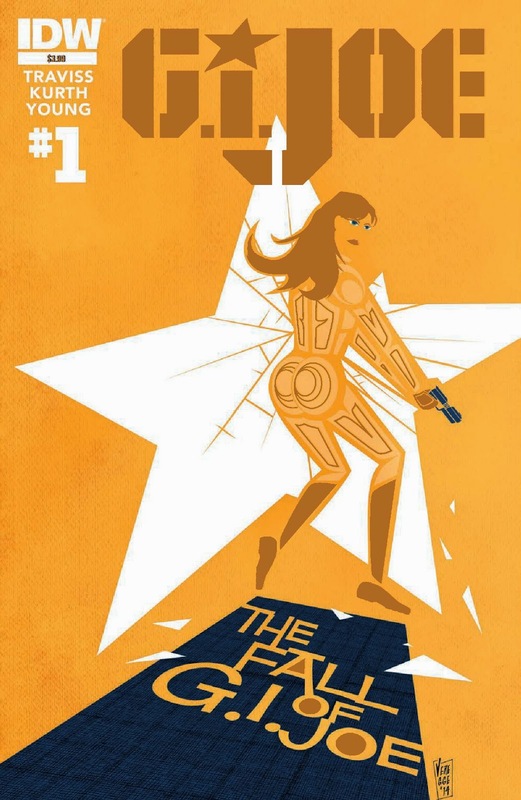 Joe #1: The Fall of G.I. Joe is a refreshing take on a storied property. The relevance of the G.I. Joe program in this day and age is called into question and some would argue rightfully so. Traviss offers something of a slow burn whose methodical pacing will likely pay off big down the line. The art style is up to the task of reflecting the difficult to navigate waters that are politics. G.I. Joe #1: The Fall of G.I. Joe pretty successfully marries the fantasy of a group's free reign to save the world with the reality of public perception and true need. G.I. Joe #1: The Fall of G.I. Joe is in stores now with interiors below.